Primarily a classical music record label Saga dabbled in Pop music through the 1960's. Early on it made a short lived business arrangement with Joe Meek to back and distribute his Triumph label. As the decade progressed Saga developed a Production Library arm, the company also being into Film Production, and did record real pop artists . The tapes for the majority of these pop recordings have been squirreled away in the depths of the British Library where they were placed by the retiring owner of Saga some 15 years ago. None but the Five Day Week Straw people have been available for nigh on 40 years. 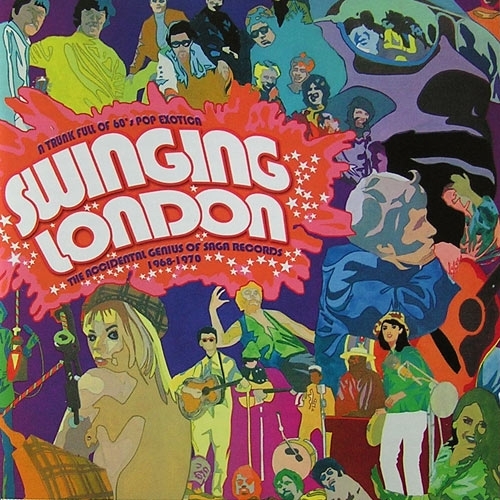 Thus Swinging London as a collection, is a fascinating glimpse of the late 60's sounds mirrored through a contemporary London production house. The sounds are not clearly of any one particular genre, as they blend elements of Pop ,Psych, Lounge and Rock into a late 60's groovy melange, and are all the more enjoyable for it. 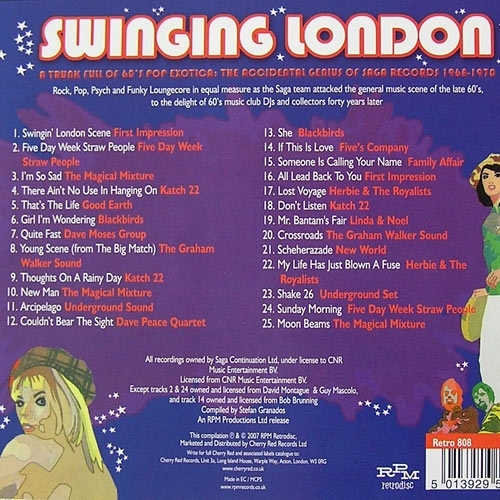 Vocal and instrumental, if these tracks had been released through Deram or Regal Zonophone at the time they would not have been out of place.